43.3" Length, 24.4" Width, 26.8" Height provide a roomy and comfortable riding for you. Sprocket: Front 11 and Rear 68. 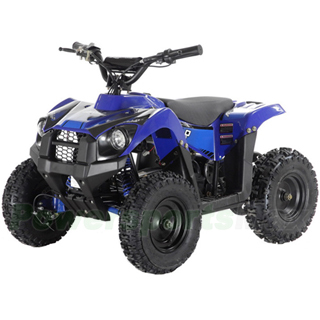 Shipping charge for one single unit of ATV-G004 is $149.95 , and you will get discounted shipping price if you order multiple item. We've had this for 2 months now and my son still rides it all the time. Has a long battery life and is more durable than the power wheels 4 wheeler. My boy has gone all over the place on his quad! Battery life is very long. Highly recommend it. Awesome little ATV! Lots of fun. Your kids will be the coolest kids on the block. I did a good amount of research before buying. This unit seemed like a good buy so I gave it a shot. It's for my 4yr old son. Gave it to him for birthday, he loves it! Perfect for a 4-7 year old. This is not a big ATV. It is NOT at all difficult to assemble. Requires very basic mechanical skills in my opinion. My 7 year old son loved it. I thought it would be intimidating but it controls well and has good battery life. My son was never so happy as he was to get this. He is 7 and this is the perfect size and speed for him. We have had no trouble with it in the grass or gravel. I did a good amount of research before buying. This unit seemed like a good buy so I gave it a shot. It's for my 4yr old son. Gave it to him for birt ..